Semiotics is the study of signs and initially it was thought to be concerned only with the products of culture. Mental phenomena, however, exist also in animals, and cultural semiotics came to be regarded as a special case of biological semiotics, or biosemiotics, a science that started by studying semiotic phenomena in animals and then it was gradually extended to other living creatures. 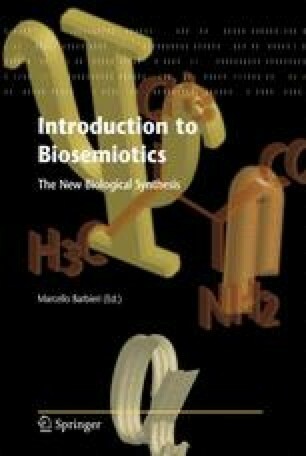 Eventually, the discovery of the genetic code suggested that the cell itself has a semiotic structure and the goal of biosemiotics became the idea that all living creatures are semiotic systems. This conclusion, however, is valid only if we accept that the genetic code is a real code, but an influential school of thought, known as physicalism, has apparently convinced many people that it is only a metaphor, a mere linguistic expression that we use in order to avoid long periphrases. The argument is that the genetic code would be real only if it was associated with the production of meaning, but modern science does not deal with meaning and is bound therefore to relegate the genetic code among the metaphorical entities. In this paper it is shown that there is no need to avoid the issue of meaning and to deny the reality of the genetic code. On the contrary, it is shown that organic meaning can be defined with operative procedures and belongs to a new class of fundamental natural entities that are as objective and reproducible as the physical quantities. It is also shown that the presence of molecular adaptors gives us an objective criterion for recognizing the existence of organic codes in Nature, and that criterion proves that the genetic code has all the qualifying features of a real code. It also proves that the genetic code is not alone in the cellular world, and that many other organic codes appeared in the history of life, especially in eukaryotic cells.